On Sunday 3rd of February, 11am at Re:Centre near Hammersmith bridge. Screening of Simon Brook’s film “Indian Summer” followed by Q & A discussion led by Dr Eleni Tsiompanou. Places are limited, so pre-booking is essential. “Indian Summer” is a film about the convergence of Western medicine and Ayurvedic medicine. Simon Brook follows the journey of a woman with cancer and her oncologist who travel to India to meet the people who helped in her recovery. Their interactions give us insights into the Ayurvedic approach to health care. A multidimensional, interactive event with guided meditation, sharing of personal experiences and knowledge about preventing, surviving and living with cancer. 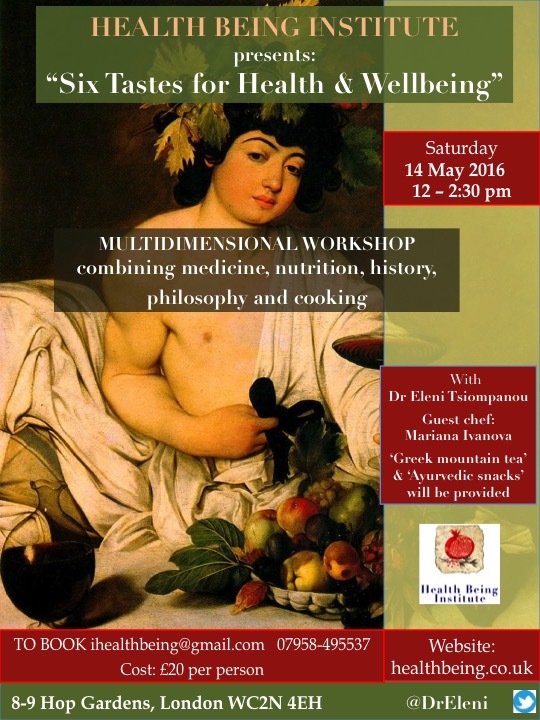 Dr Eleni presents Ayurveda to a modern audience, helping you find your way to better health, harmony and well-being. Aromatic Indian snacks will be available. 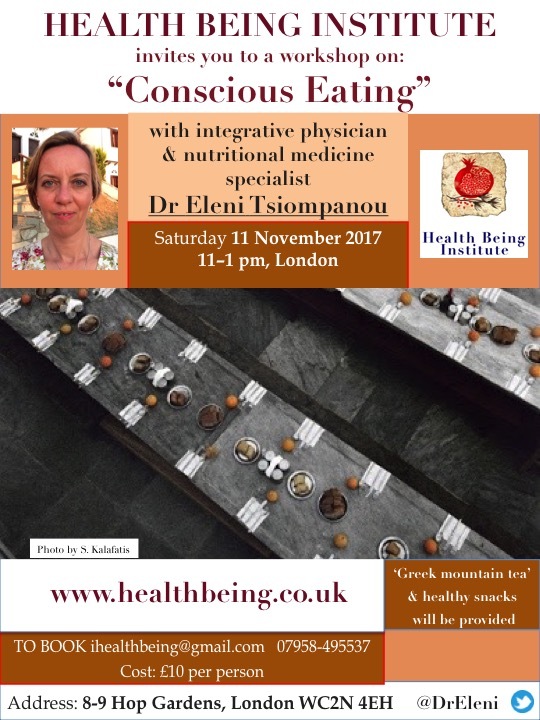 Dr Eleni Tsiompanou – Founder of the Health Being Institute – is an experienced medical consultant who has worked in the NHS since 1997. 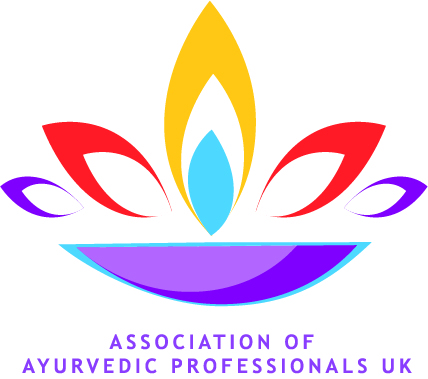 She is a Fellow of the Royal College of Physicians of London (FRCP) who has also trained in Ayurveda and nutritional medicine. 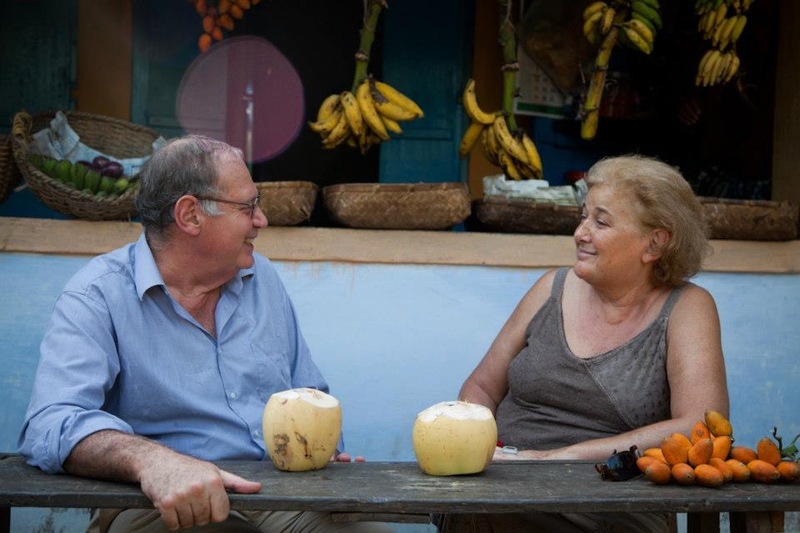 Eleni’s personal quest, knowledge and ongoing research has uncovered gems of practical information which can help people find better health and harmony. As an Ambassador for the ‘College of Medicine’ in the Harmony project, Eleni is inspired by HRH, The Prince of Wales’s book Harmony: A New Way of Looking at Our World, which reminds us of some profoundly important truths, namely that everything in the universe is connected and balanced by universal laws and relationships. Healthy eating has to do with what we eat, what we absorb & how we eat. We can combine conscious eating to all these aspects: primarily by eating with attention, mindfully but also, by learning to eat according to our type & choosing foods that are from a sustainable source. - influencing our energy and awareness. 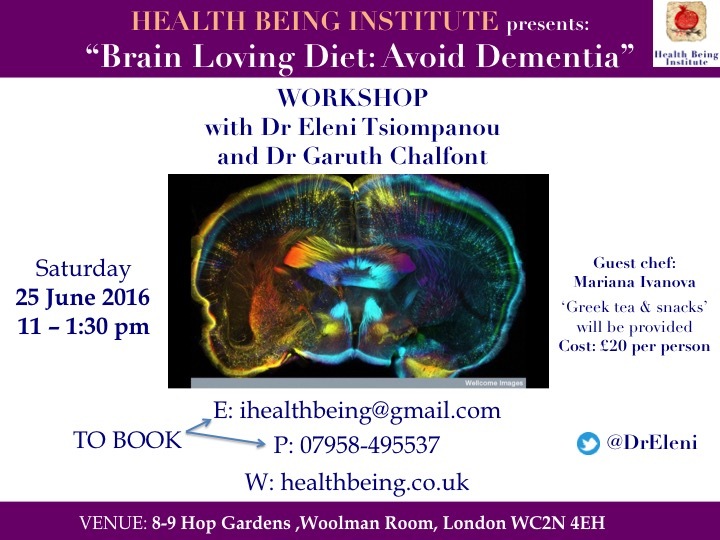 We are going to explore these useful principles in the “Conscious Eating” workshop. 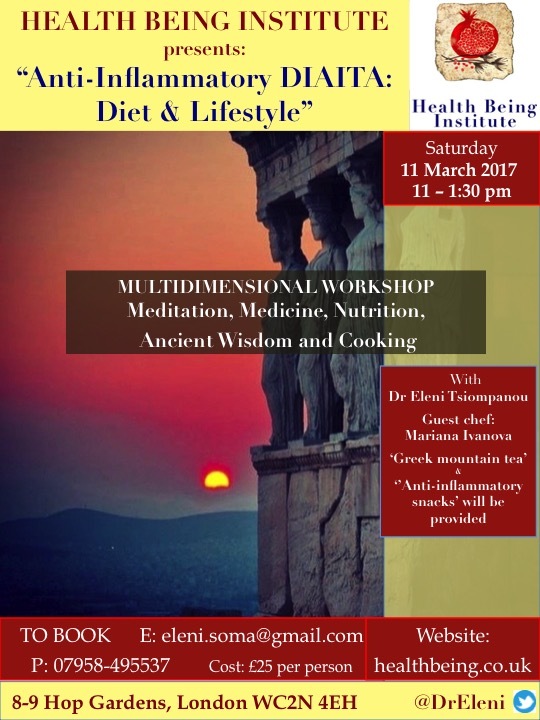 The Health Being Institute “Diet and Philosophy” and “Medical Kitchen Wisdom” workshops provide an opportunity for people who are searching to bring together wisdom and science for the benefit of themselves, other people they know and the wider community. Workshops provide an interesting, joyful exchange, learning from each other in a relaxing environment, with a healthy snack and tea provided. Booking is essential. Places are limited and demand is high. Cost: £10 per person. I can provide you with a CPD certificate, if you need it. 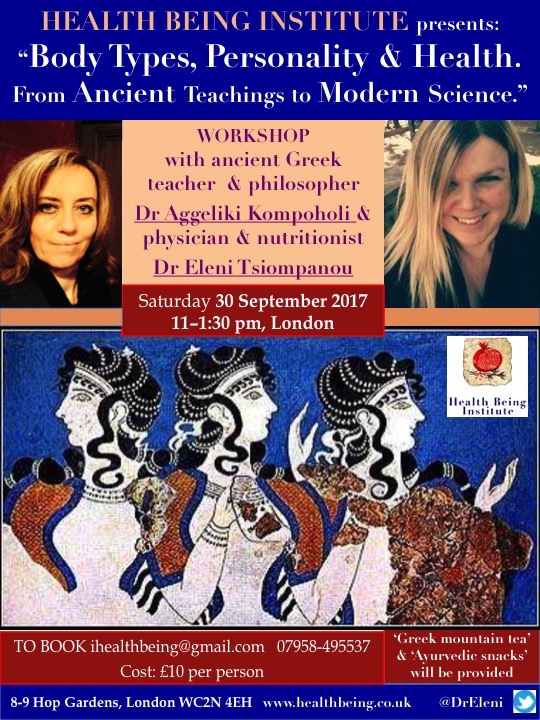 The Health Being Institute workshop ‘Body types, personality and health – from ancient teachings to modern science’ will take place on Saturday 30th of September 2017 11am- 1:30pm, Central London. I’m really pleased to have a co-presenter Angeliki Kompoholi from Greece. 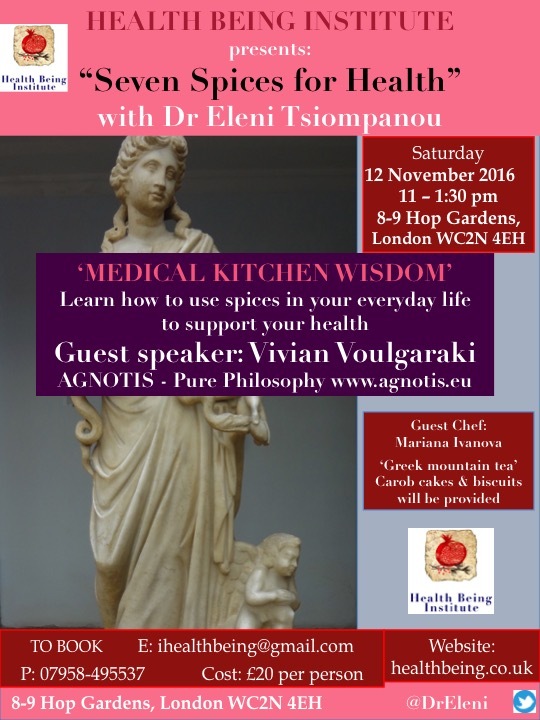 Angeliki brings an in-depth knowledge of Ancient Greek and literature and, a skill in bringing this timeless philosophy and wisdom to life, making them relevant to our everyday world. From ancient traditions, human types have been described by the Humours: choleric, phlegmatic, sanguine and melancholic and in Ayurvedic Medicine by the five elements of ether, air, water, fire and earth. Ancient Greece? Angeliki and I aim to relate this wisdom to the newer discoveries in medicine such as epigenetics and to help you find practical ideas to improve your ‘health being’. How can diet, lifestyle, mindfulness and connection help our ‘type’? I hope you can join us. Booking is essential. Places are limited and demand is high. Cost: £10 per person. 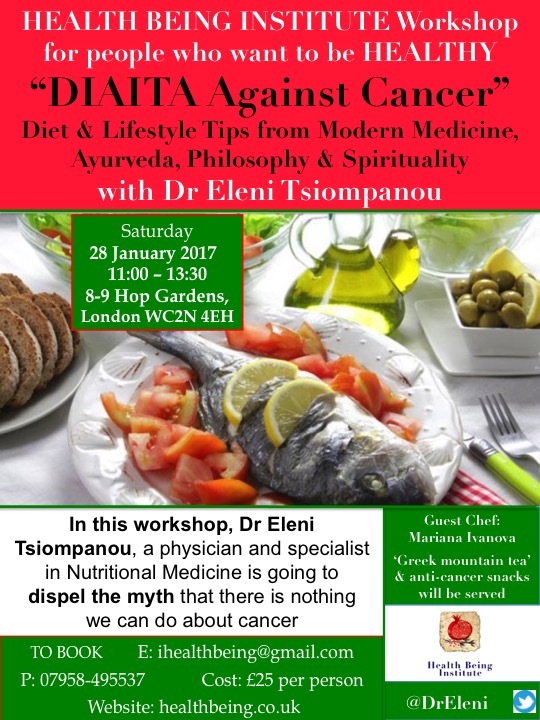 Following our last successful meeting on Anti-Cancer DIAITA, in this multi-dimensional workshop, I will expand on ways to reduce inflammation in the body, the primary cause of many diseases such as cancer, heart disease, auto-immune diseases, depression etc. I will explore Science, Medicine and Ancient Wisdom to find the available knowledge and understanding offered to us to create an anti-inflammatory way of living. • a connection with other people, the environment & something higher than us! Connect with others in a friendly environment which invites questions and offers answers to a modern problem of an ‘inflammatory life’ that affects us all. Learn about healthy meals, herbal remedies and easy recipes to use in your daily life. Explore philosophy, spirituality and try meditation to connect with your body. 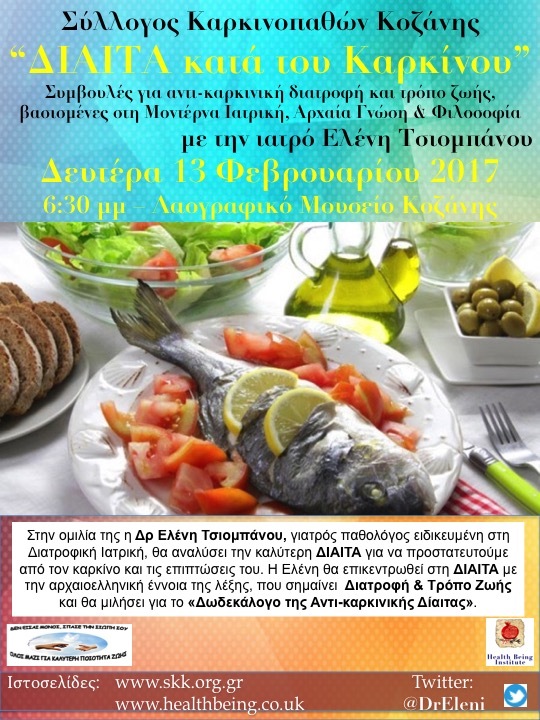 Saturday 11th of March, 11-13:30. Book early to avoid disappointment as places are limited and demand is high.